The Midden's main feature is the Atronach Forge. Near it, the book Atronach Forge Manual can be found, along with the components to create the atronach recipes within. It refers to other Atronach Forge Recipes scattered about Skyrim. 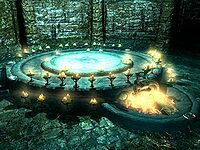 Having a Conjuration skill of 90 will allow the Conjuration Ritual Spell quest from Phinis Gestor to be started, which will result in you obtaining a Sigil Stone, which can be placed on the pedestal of the Atronach Forge. Some recipes require this object. As part of Fall of the Space Core, Vol 1, the Space Core can be placed on the pedestal and is necessary to summon a Dovahcore Helmet. The Atronach Forge has an offering box and a lever. The lever must be pulled once for each conjured result. Before activating the lever again, previous activation animations must begin or nothing will happen. The forge prioritizes recipes using two form lists of recipes. The first list contains the daedric recipes and is only used if the Sigil Stone is placed in the receptacle, and the second list is always available. From these lists, the items are prioritized in ascending order of their index number as indicated in the table below. The forge chooses to use ingredients alphabetically when multiple available types would be valid. The forge will not normally consume extra ingredients in the box, but due to a bug, each recipe which uses a soul gem will consume both a filled soul gem and an unfilled gem if both are available. Finding a copy of the recipe in the world is not required to craft that item. If you supply the necessary ingredients, any of the items are available. In the table below, "Delta" means the gold price difference between the forged object and the combined value of the cheapest items needed to create it and the priority is the order in which the recipes are chosen, with 1 being first. or two different ones)† Hostile to you. The type summoned is a leveled melee fighter. Iron Helmet Refined Moonstone or Moonstone Ore Requires Space Core. Fall of the Space Core, Vol 1 must be installed. †Even though two pieces of meat are supposed to be required, both can be fulfilled with a single piece of meat. ‡A Silver Greatsword can also be used. §The Daedric boots produced are an unenchanted pair of the Dremora-specific boots, not the standard Daedric Boots. See the bugs section below for details. A decent amount of profit can be made by creating dremora with the forge. The dremora will always carry a weapon enchanted with fire damage and a daedra heart. You need only one daedra heart and an excess of raw meat and skulls to create numerous enchanted weapons. Atronach Forge Recipes 1-17 are written in the Daedric Alphabet. The "Ebony to Daedric" transmutation does not work with pre-enchanted items, only an unenchanted or custom-enchanted ebony weapon or armor can be turned into Daedric. Custom-added enchantments will get lost in the process. The Daedric boots produced are the Dremora-specific boots (000f1abd) not the standard Daedric Boots (0001396a). They will not show up in your inventory but will add weight to your character. If you have already picked them up, the bug can be fixed through use of console commands. Type player.removeitem f1abd 1 to remove the invisible boots, and player.additem 1396a 1 to add the actual Daedric Boots. Attempting to place the Space Core on the pedestal while in possession of the Sigil Stone will duplicate the latter. ? To place the Space Core, you will need to drop all Sigil Stones from your inventory. The Random Daedric Enchanted Weapon recipe produces only warhammers and waraxes. By placing viable options for the same recipe in the offering box, the forge will consume one of each, rather than just one. For example, placing a ruby and a flawless ruby with a bowl of fire salts will create a flame atronach, but use both ruby and flawless ruby along with fire salts. The same works for all other items. This page was last modified on 23 February 2019, at 14:10.